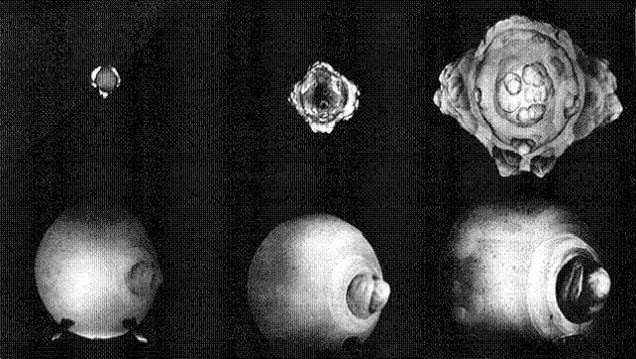 These (below) are photographs of the first few milliseconds of nuclear explosions. 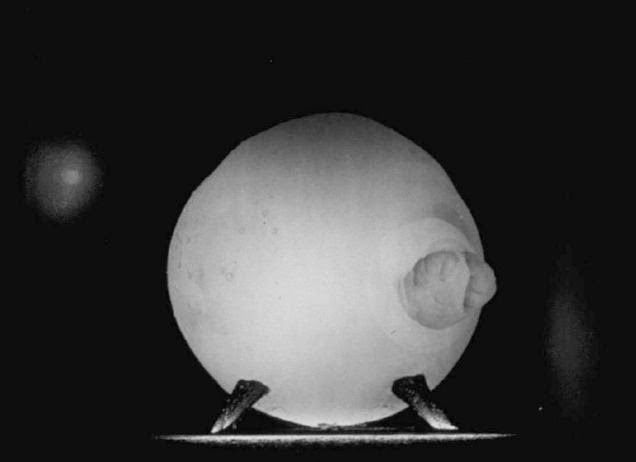 They lead scientists to several new discoveries as to how nuclear bombs worked. But how do you capture the first millisecond of a nuclear bomb? With several rapatronic cameras, a Kerr cell, and a little physics. In the late 1940s and early 1950s, every new test, and every advance in power, taught scientists more about how nuclear fusion behaved. Once they had worked out the mechanics of nuclear bombs, they still craved details, and details were hard to come by when something went nuclear. One major advance in the study of detonations was the invention of the rapatronic camera. It allowed scientists to get pictures of the explosion mere milliseconds after it went off. It showed them the spikes that were soon to be christened the rope trick effect. It showed them the curious mottling of the explosion, and the many forms that the explosion took. But how was it done? No camera had a shutter that could close in milliseconds. It was, at the time, mechanically impossible. And so they made a camera that did not require a mechanical shutter. A rapatronic camera starts with two polarized lenses. Polarization is basically a kind of striping that allows only light waves oriented in one particular direction to come through (it's used often in sunglasses). A few minutes of playing with polarized lenses allows you to notice a neat trick. If you have a lens that's polarized one way, and layer another lens over that is polarized at a 90-degree angle to the first — so the two lenses are in a criss-cross pattern — you will block out all light. But there's a twist. If you put a third polarized lens between these two, and set it at a diagonal to them both, suddenly light will get through. Scientists did the equivalent of putting a temporary lens between those two polarized lenses, and put in a Kerr cell. A Kerr cell is a suspension of electrodes in liquid. When it is shot through with an electric field, it creates a refractive index that rotates the light polarization. So the light passes through the first filter, is polarized, and is then twisted around so it can pass through the second filter. When the electric field is gone, the Kerr cell returns to normal, and the two lenses completely block the light again. This happens via electricity, not mechanical movement, and so could be cut down to only 10 nanoseconds. The result? Spectacular images of history's most dreaded weapon.